Whether cooking is a joy or necessity for you, the more recipe ideas you have and the more ingredients you can work with, making it more fun and more varied. We aren’t all going to be the next big TV chef (well some of you maybe! ), but adding a few more skills and some different ways to vary your cooking with different ingredients and techniques, will be good for your body and soul. So, today we are focusing on an ingredient you may not have cooked extensively with, or may have sometimes overlooked – ground turkey. In this article, Grills Forever team will take you through the three most popular ways of cooking ground turkey; in a pan, baked, grilled, as well as some tips and watch out warnings. And to be honest, nothing beats the sheer pleasure of making a burger on a smoker grill and serve it hot with ice cold beer! 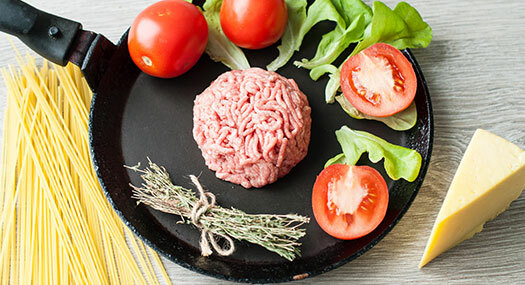 Right, so if you’re wondering why we’ve chosen ground turkey, and why indeed we’ve chosen it over ground beef, let’s start with telling you a little more about ground turkey before we cook it. First fun fact – turkey is not from Turkey, it’s from Mexico, and Israel is the world’s biggest eaters of the meat. Turkey is famously eaten whole during Christmas in the UK and during the Thanksgiving in the US. However, you can get many different cuts of turkey, from diced, to sausage, to strips for stir-frying, burgers, and of course, ground mince turkey. 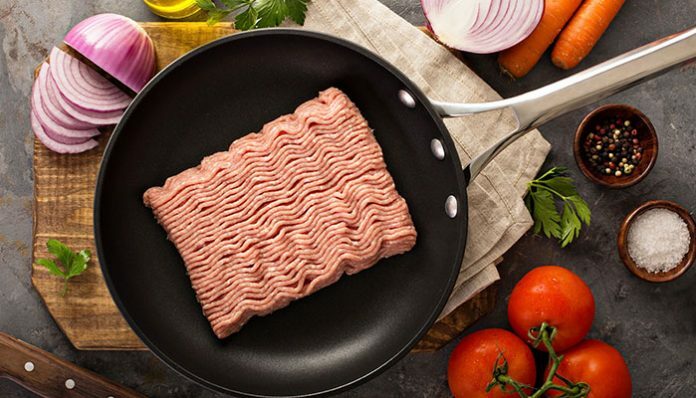 Ground turkey is quite simply a mix of turkey meat, ground together until it looks like the ‘ground’ form as we know it. One of the major benefits of cooking a ground turkey is that it is often a lot cheaper (because it is made from thighs and drumsticks, rather than breast), and arguably a lot healthier than ground beef. If you’re looking for a super health ground turkey variety, look for one that is fat-free, as the meat will come from the leanest part of the bird as possible. With this article, you will learn how to cook ground turkey well, so it has a great flavor that you can eat on its own with salad, or add it to a soup, curry, or pasta dish, whenever a recipe calls for ground meat – it’s so versatile! 1. How to Cook Ground Turkey Simply in a Pan? When cooking ground turkey in a pan, you need to make sure the pan starts off hot before adding the meat. Start by adding a good lug of oil to the skillet, on a medium-high heat – a few teaspoons will do and leave for a minute or so. Add the ground turkey to the hot pan, and use a wooden spatula to break it into separated pieces. Do not leave it as one block, but break it up. Leave to brown for 4-5 minutes, without stirring. The ground turkey will begin to brown, turning a white-grey color at first. As it does, continue to break the meat into pieces. Season with salt and pepper. After each stir leaves the ground turkey to cook itself, avoid the temptation to stir too much. The ground turkey will need about 14-16 minutes in total to cook. It will be cooked when it’s all browned evenly, and there is no pink. If you want to be really sure it’s cooked, you can test it using a thermometer – it should be at least 165 degrees F.
2. How to Bake a Ground Turkey & Make a Baked Meatloaf? Parsley – 1 to 1 1/2 tsp. Black pepper – 1/4 to 1/2 tsp. Preheat your oven to 350 degrees F. Dice the onion, shred the carrot, mince the garlic and chop the parsley. Start by adding a good lug of oil to the skillet, on a medium-high heat – a few teaspoons will do and leave for a minute or so. Once your pan and oil are hot, add the vegetables and sauté until they are soft. Once sautéed, add the vegetables, along with the ground turkey, parsley, breadcrumbs, eggs, and pepper to a bowl and stir well to combine the ingredients. Line the loaf tin with some oil, only a couple of teaspoons, then pour the ingredient mix into the tin. 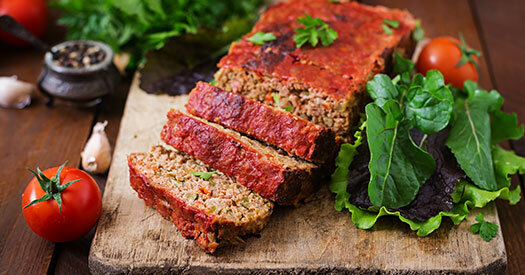 Bake the ground turkey meatloaf in the oven for 40 minutes. It should be baked after 40 minutes at 350 degrees F, but if you want to be really sure it’s cooked, you can test it with a thermometer – it should be at least 140 degrees F in the middle. Let the baked meatloaf sit and cool for 5 minutes. Use a spatula to transfer the meatloaf from the tin to a plate. 3. How to grill ground turkey and make burgers? Garlic powder – 1/2 tsp. Ground black pepper – 1/2 tsp. Cayenne pepper – 1/4 tsp. Add the ground turkey, salt, garlic powder, ground black pepper and cayenne pepper to a bowl and stir well to combine the ingredients. Knead for about 2 minutes to really mix everything together. Preheat your grill to high. Mix about 1/3 cup of the mixture and mold it into a patty burger shape. Repeat until the mixture is all used up. Cover and cook for 5 minutes on the grill. Flip and cook covered for another 3-5 minutes. 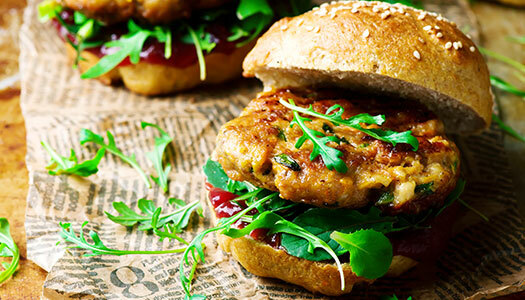 Serve the burgers as desired – on their own, or add to buns for a health hamburger alternative. We’ve got a few handy tips to make your ground turkey extra delicious! Drain the oil – when cooking ground turkey in a pan, make sure you drain away all the grease once cooked. You can easily do this by placing it on a plate with a few sheets of paper towels on. Knowing some facts about the oil used in your turkey fryer might also be helpful. Store it – you can eat cooked ground beef immediately, but you can also refrigerate it for a week or freeze it for 3 months. Season it – when cooking ground turkey in a pan or grilling turkey burgers, experiment by adding your choice of herbs and spices. You could add sage, oregano, rosemary or Worcester sauce even, maybe even a teaspoon of parmesan to the burgers! Make meatballs – instead of baking your turkey mix as a meatloaf, shape the mixture into balls and bake them in the oven at 400 degrees F for 15-20 minutes. Don’t overhand the ground turkey – when it’s over-handled, it compacts together and is tough to eat when cooked. Don’t overcook – if you overcook ground turkey it goes dry and crumbles into bits. Don’t undercook – Unlike beef, a medium rare option isn’t something you can do with ground turkey. By now you should be running to your pan, grill or oven to get the ground turkey on! Whether you bake ground turkey, grill or cook it in a pan, there are lots of ways it can be cooked and even more recipes you can use it in. Some ideas include: replacing the ground beef in your traditional spaghetti bolognese, lasagne, or shepherd’s pie, stir it into your favorite soup, pop it in a taco or add it to some stir fried rice – turkey is a lot more than just Thanksgiving!